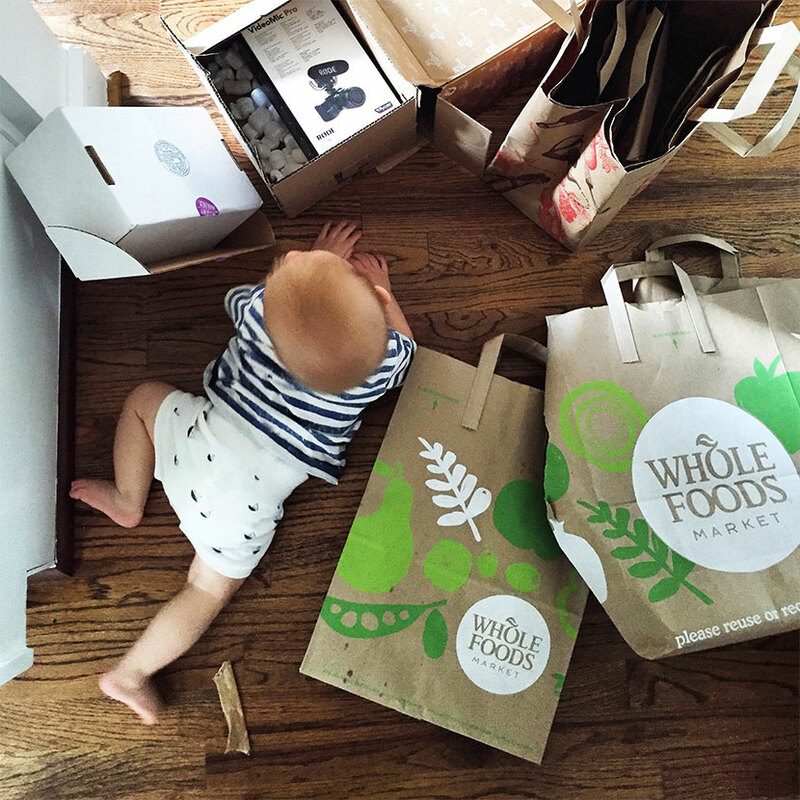 There is quite possibly nothing harder than moving with a baby. Moving alone is hard. It is really hard for so many reasons, but moving with a baby maybe close to the line of impossible. There are many things I wish we had done different and things that out of survival and quick decisions I know we did right so I thought I would share some tips with you guys. To begin and to put all of this into some sort of perspective, when we moved we were also closing on land, hiring people to make fixes the house for the buyer, and on top of it all Hayes got Roseola (look this up because it is SUPER common for babies between 6 months to 2 years…basically it is a high, scary fever with no other symptoms, that breaks and they get a rash and they feel icky). This all meant that not only was a move stressful we also weren’t getting sleep on top of it all. So this was a tough couple weeks for us on top of the emotional goodbyes and everything else. In many ways by the end of it all I was pretty close to a mental breakdown and took some time off to recover. You can catch some Instagram posts here and here. Anyways, during that time I kept reminding myself of the positives of what we were doing and why we were doing this. It helped me chug away sometimes minute by minute of each day in the process. I did look at that time as a great opportunity to grow, learn my limits as a parent, and become stronger, which I think any time you move does for you whether just down the street or across the world. If I did this again, I would spend the money on either a babysitter or someone to just come and box up our things. The last thing we wanted to do was spend more money at this point, but looking back now it would have been worth it to take the time to do this. We did end up hiring someone to come and help Mike pack the truck one evening. It was the best money we spent that week and if we did it again we would have hired a few guys to do it all so we could have both tended to Hayes together especially when he was sick. There was a moment where I was trying to fix the refrigerator while Mike was gone getting the title on our car and I turned for a second and Hayes spilled the dog’s water bowl ALL OVER the floor. It was a huge mess and he was sopping wet and so was everything around him. In that instant I pushed buy now on a playard on Amazon because we needed to contain him. It wasn’t cheap, but it kept us sane. I had been debating about buying it for nearly 4 days at that point I just wish I had bought it 2 days prior. Your gut knows best so listen to it. Do not. I repeat….DO NOT attempt to cook while you are moving especially at the end with a baby. Just order takeout and worry about your health later. Mike ended up doing it since I left the day before we had to be moved out, but I felt terrible he was doing it alone while he also was packing the rest of the truck. I wish we would have just paid for someone to clean the house top to bottom since there was already a lockbox on the door. It was an easy thing to do compared to Mike doing it all on his own. If you have a similar situation where you baby comes down with a fever know what your plan is to both get sleep, stay on track, and if you can’t leave right away where you will stay after you have to be out of the house. Knowing these things ahead of the time helps to take the stress out of things when they get hairy. To keep the baby from losing sleep and you partially sane, pack up everything essential to your baby’s routine very last. Try to not disturb routine as little as possible. This I think was what kept Hayes getting as much sleep as possible when he was sick. We kept him in his crib as long as we could. Also, this meant his crib was the first thing out of the truck as well, which was nice to help him get settled at our new place quickly. As hard as that final flight was (1.5 extra hour on the plane + a 3 hour delay + running out of diapers), I am glad we took it. We weren’t sure if we would considering Hayes had had a fever and I was run right into the ground, but the night before the flight his fever disappeared so we decided it was best for me to fly and Mike to meet us in Michigan. I still don’t regret that decision. The idea of going in and out of multiple hotels over a few days with our dogs sounded like a nightmare. Getting him settled was the most important thing. When you are moving and your baby is mobile, it is EXTREMELY important to keep an eye on them and keep dangerous things out of their reach. 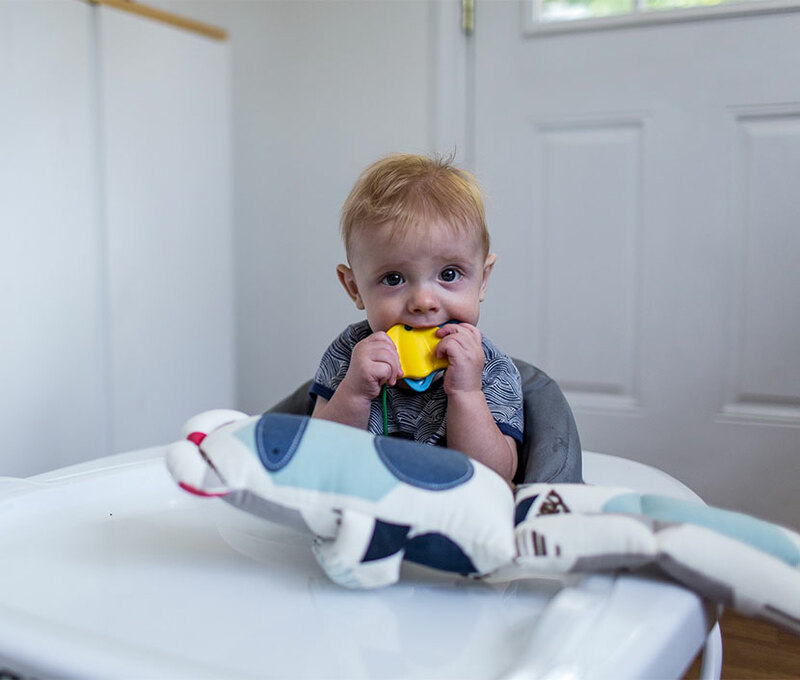 It is hard when your house is far from being baby proofed, but I do everything you can or get a playard or baby walker to keep them as contained as possible. I kept trying to keep up making Hayes fresh solid food every day and by day 8 I caved and bought a dozen pouches of food. I was trying to be some perfect idealized level of mom at a time that it was stupid to expect that of myself. Now, we love having these packets around in our bag for when Hayes gets hungry or needs a snack while running errands. They also serve as great entertainment on planes as well. Though I think half of it ended up on both of us while we traveled haha. If you are breastfeeding, take into account the amount of stress your body is about to go under. Think ahead about what you will do if you milk supply drops and know what you plan to do. I am glad I knew what I would do because mine dropped quite a bit especially when Hayes ate a lot less when he got sick. I already had a formula picked out and everything and had tossed around all the pluses and minuses of supplementing him. Sure enough, it was great and was one of the easiest things to handle in the process. 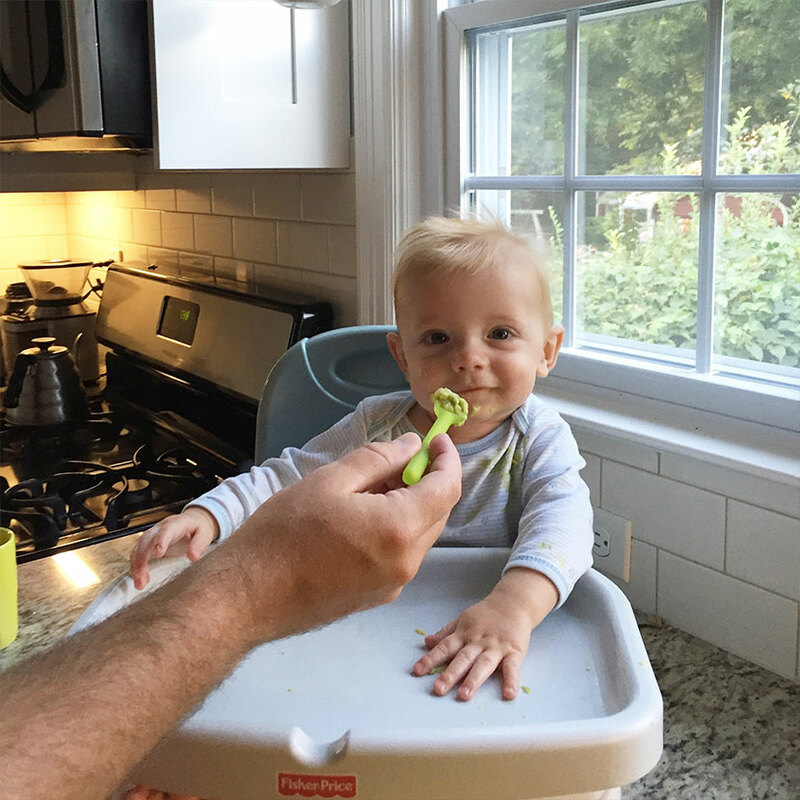 Now, we are back up and running fully, but the stress of not being able to feed your baby is one you don’t want. Know your body will recover, but just know what you are willing to do in the in-between time. In all honesty, now we still supplement because it takes me off duty more so I can work more easily, not to mention I do believe it is helping with longer night time stretches even though he is about 75% breastfed and 25% formula fed now. One day my cousin offered to come and help. We thought she would be playing with Hayes, but he was sick and grumpy and very attached to me so she was able to pack up our kitchen and our studio for us. To this day I couldn’t be more thankful for her considering the night before Hayes had spiked a 104-degree fever and we spent the morning at the doctor. She saved us that day. So, accept the help no matter what it is. This is not the time to be a control-freak. 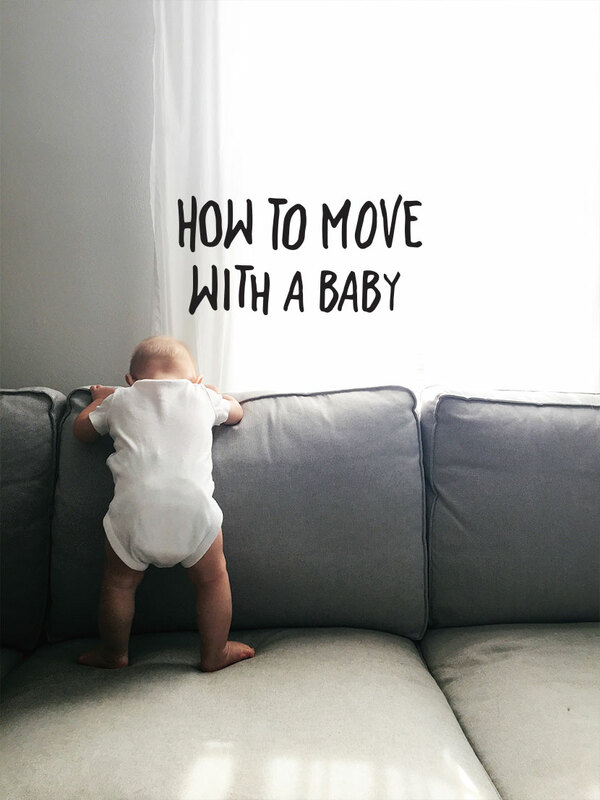 Have any of you moved with a baby? What did you do? What did you learn? What tips would you share?! Though we aren’t moving cross-country in the coming year, we are moving across town (storage unit to finished home) and may need some more tips so we would love to hear them! We moved from NYC to the south of france when our kid was 3 months old. the upside is that when they are little, they change so quickly that you would be getting rid of a lot of gear anyway. the bathtub for newborns, the bassinet, the play blanket all were getting to the end of their usefulness. So i sold them all on craigslist and bought bigger on arrival–a bigger bathtub, a crib, a playpen. you need a mix of sitter and helper. some things only you can sort, and that needs to be done when you have a sitter. once sorted, you can hire movers to pack. be very careful about the movers. the company we used had said they would load everything into their truck and pack it at their warehouse–easier than doing it in the confines of a small apartment. Liars. OUR STUFF WASN’T EVEN PACKED–IT WAS STACKED ON A PALLET AND SHRINK-WRAPPED. THE COMPUTER ARRIVED WET. We moved and took on a renovation of our new place right around the time my son turned one. i definitely agree that hiring movers and cleaners was an immense help. i tried to plan my son’s birthday at our place right after we had moved in, which was a really ambitious and foolish move on my part! never again! the playpen was also a great help, i agree. i would just in general avoid taking on any extra responsibility if i did this again in the future, and hire all the help i could get. just revisited this post as we are about to move across the country with our 14month old. we’ve definitely had a “throw money at the problem” approach. We are shipping not only our stuff but our car so we can fly with carry-ons, the carseat and pack and play, and that’t it. people have asked us why we aren’t taking advantage of the opportunity to drive cross-country.